In the aftermath of the Manchester Arena bomb attack, the government's approach to tackling radicalisation has once again come under scrutiny. 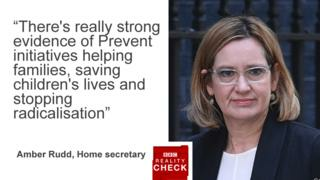 Reality Check has been looking at the government's Prevent programme - asking how it works and why it divides opinion. Prevent is one of four strands of the government's counter-terrorism strategy, known as Contest. It was created by the Labour government in 2003 and its remit was widened by the coalition government in 2011. Prevent is designed to support people at risk of joining extremist groups and carrying out terrorist activities. In practice it means police and other organisations trying to build relations across the UK and putting programmes in places such as schools, faith organisations, prisons and other communities where people can be at risk of radicalisation. It requires faith leaders, teachers, doctors and others to refer any suspicions to a local Prevent body. An assessment is then made about whether further action is needed. Social services departments have become increasingly involved in identifying Prevent cases because of their duty to counter radicalisation. About 7,500 referrals were made to the scheme in 2015-16 - the equivalent of 20 a day - according to a Freedom of Information Request to the National Police Chiefs' Council (NPCC). Out of those referrals, action was taken in one in every 10 cases. No action at all was taken in 37% of the cases, while a quarter of people referred were found to be vulnerable but not at risk of terrorist involvement. The remaining 28% were still being considered. In cases where an ideology was recorded, just over half related to Islamist extremism and nearly one in 10 were linked to far-right extremism. In some areas of the country, including parts of north-west England, the number of far-right referrals far outstrips the number of Islamist cases. Where action is taken, an individual can be placed on the government's Channel Programme. This is a support plan which may include mentoring. The annual Prevent budget is not officially published - but it is thought to be around £40m a year. We do know that after the revised strategy was published in 2011, the government set aside £46m of spending (£36m from the Home Office and £10m from the Foreign Office). David Anderson - the former independent reviewer of terror legislation - has said Prevent receives 1% of the overall £3bn counter-terrorism budget. While the Prevent strategy has divided opinion, the government says it is working. It says 150 people, including 50 children, were stopped from entering conflict zones in Iraq and Syria in 2015 because of the strategy. The government also says that its counter-radicalisation programmes reached more than 42,000 people in 2015/16. The strategy is also backed by senior police figures. The Leicestershire Chief Constable Simon Cole has called it "absolutely fundamental" in tackling terrorism in the UK. He said the scheme was about "putting an arm around" people at risk of radicalisation: "We try and divert, allow people the opportunity to help them make better decisions. It's absolutely fundamental. It has enabled us to try and help stabilise communities and stop people getting us into a cycle of aggravation." The Prevent strategy has been criticised by some MPs, the National Union of Teachers and the Muslim Council of Britain. Some argue the strategy is counterproductive and that it can make Islamic students, for example, feel isolated and possibly more open to radicalisation. Another worry is that it can add to a general sense of distrust across communities. A former senior Muslim police officer, Dal Babu, said in 2015 that Prevent had become "tainted" and "toxic". He argued that Muslim community organisations "have this Prevent [label] stamped on them and are then vilified". The Muslim Council of Britain says Prevent is too intrusive and references are over-zealous. It gives an example of two college students stopped by a lecturer who noticed that they had made way for two female students and lowered their gaze. The Council says they were reported to the senior team for "concerning behaviour". Another problem is that it is very difficult to measure the full extent of the strategy's successes and failures. It is impossible to know how many people may or may not have gone on to commit terrorist acts without coming into contact with Prevent. What do the manifestos say? The Conservative manifesto does not make specific mention to Prevent. It does, however, say: "We will continue to invest in our world-leading security services and maintain and develop our counter-terrorism strategy to protect us from terrorism at home and abroad." Speaking to BBC Radio 4's Today programme in the aftermath of the Manchester attack, Home Secretary Amber Rudd said that if the Conservatives were re-elected, the strategy would receive more money. Labour's manifesto pledges to review the Prevent programme with a view to assessing both its effectiveness and its potential to alienate minority communities. It says: "In doing so, we will address the government's failure to take any effective new measures against a growing problem of extreme or violent radicalisation." The Liberal Democrats say they will scrap Prevent altogether. Its manifesto says it will "replace it with a scheme that prioritises community engagement and supports communities in developing their own approach to tackling the dangers of violent extremism". The SNP is yet to publish its manifesto. However the party has previously called for a review into Prevent, saying the strategy leads to "confusion and alienation and risks being significantly counter-productive". UKIP's manifesto does not explicitly mention Prevent. The party did pledge, however, to segregate extremists from the wider prison population to prevent a spread of radicalisation.